John Lalor has placed text into the pages of The Irish Times. A total of six columns, of distinct black text on red, have appeared over the course of a month or so. The columns were anonymous and dealt with cinematic matters of an esoteric bent; many regular readers of The Times were said to be confused, some becoming agitated, upon coming across the artist’s work. One of my favourite gestures by an artist in the history of 20th century art was carried out by Yves Klein on November 26, 1960. On the shelves of Parisian newstands, slipped in to those beacons of current affairs, les kiosques de presses, appeared Dimanche – Un Journal d’un seul jour. A one day paper. I don’t know what it is about the French capital that sets artists reaching for newspapers to make their swats at the everyday. Libération has had a whole plethora of them redesign its pages down through the years. The art critic Félix Fénéon wrote hundreds of short stories in three lines (republished in a wonderful NYRB edition, edited by Luc Sante) for Le Matin. It was no surprise then to hear that John Lalor, an adopted Parisian, had turned his gaze to a newspaper. The timing of this intervention seems propitious. Just as the quest to resurrect the avant-garde gesture asserts itself once again in a digital age, print newspapers are fumbling around, scratching their heads as to how to go on surviving in the age of the Internet. The Murdoch Machine seems to be barking about charging users every week these days. The Irish Times then, the newspaper of record for a country recently shaken to its core in matters economic, religious, social and European (with the referendum on the Lisbon Treaty), seems to be a challenging locus for a decidedly French interlude amongst its sombre columns. Lalor after all is concerned here with Jean-Luc Godard. We see straightaway Jean Seberg strolling along the Champs-Élysées, crying out ‘New York Herald Tribune, New York Herald Tribune.’ Godard is many things to many people and in a way his work with cinema, that most avant-garde of 20th century new media, offers the perfect blueprint for renovation, reappraisal and reinvention in a medium that finds itself seeking fresh definitions. The entire text, delivered in Lalor’s increasingly characteristic – can one really say recognisable? – rolling semantics would seem to be a sort of academic quest for who said what about who, sparked by a visit to the Beaubourg’s Voyage(s) en Utopie overview of the French-Swiss director’s work. A mystery saga that hooked the readers of The Irish Times for a number of weeks, the anticipation of tracing a thin line of investigation in the history of modern cinema barely controllable. I like to view Steoro JLG as a reminder to us that the realm of the everyday is open for the artistic, avant-garde (mainland European) gesture, that the facets of advertising and marketing can be used to bring art to new audiences or, while we’re at it, that empty buildings can house non-profit ‘businesses’, or redundant institutions aren’t the only givers of education and tradition. Such facts are exactly what The Irish Times is full of these days. John Holten is a poet and novelist living in Berlin. The artwork currently unfolding in the pages of the Irish Times is the latest iteration of an artwork which Paris-based artist John Lalor created 4 years ago at the Centre Culturel Irlandais, Paris, in response to a major exhibition at the Pompidou Centre, Voyage(s) en Utopie, Jean-Luc Godard, 1946-2006, A la recherche d’un théorème perdu, celebrating legendary Franco-Swiss filmmaker Jean-Luc Godard. So the use of the red alcohol marker being a type of metaphor for video regarding its usage, its history, its very invention, leading eventually to its relationship to cinema. How it would be regarded as a type of impertinent art form, in some way democratic perhaps like bleaching agent with its arrival into every home in the latter part of the 20th century. Then video’s rapidity, its eventual exclusion or omission of laboratory developement. Compared to red marker and its position in relation to pencil/crayon or classical rendering ie. the instant drying of red marker. Imagine drawing classical landscapes with a red marker with its constant emphasis on cross hatching. Would the red marker be compared in some way as comics to literature. The text on Godard stereo jlg/the editing of the trailer will be rendered in red marker instead of red paint, rendered in 7 columns on three walls taking the aspect of a wall painting, thus addressing the space in its entirety in a three dimensional way. In this case only one thousand words will be rendered giving a glimpse of the text. The corrective editing furnished by the word processor recognises the name Godard but not that of Ken Loach, resulting with a capital letter for the first and not for the latter. This logic will follow through on the wall painting but not on the printed text on paper, the entire text will be found according to the wall plan of the room printed on paper also in 7 columns. An actor will be asked at a later stage to talk the text out, walking from room to room rather like Belmondo in à bout de souffle, smoking a cigarette, just talking out the text which he will evidently have learned. The event will also be filmed, a camera tracking the actor from behind, the event will be treated as a suprise performance rather than a problem of re-presentation in a classical way. The actor will also be given the choice of learning either the entire text or just his favourite parts once again emphasizing the idea of editing. In conclusion the text stereo jlg/the editing of the trailer will also make its way into journalism being printed in 7 red columns again and then simply scattered throughout the newspaper, wherever it lands ie. through tragic or joyful headlines, through the sports pages, deaths wherever it lands literally. Rather like the tv series Twin Peaks existing through, news headlines, the various commercial breaks, advertising, etc. “Voyage(s) en Utopie” – a major exhibition designed by Godard – was the result and residue of an initial project “Collage(s) de France”, conceived by the filmmaker with the former director of cultural development at the Pompidou, Dominique Païni. This exhibition was abandoned in 2006 after much public and media controversy. The final exhibition carried the traces of the initial project – an exhibition about a failed exhibition – as attested by the many maquettes, the hand-written sign bearing the name of the unfinished project crossed out forcefully in marker and the official museum disclaimer at the entrance of the exhibition justifying the abandonment of the project for artistic, technical and financial reasons. The end result was an experimental exhibition at the crossroads of cinema, theory and the visual arts – a plethora of objects, symbols, signs, found texts, films – a veritable construction site presented and laid out according to the various methodologies of collage, montage and juxtaposition constituting a highly personal vision and theory of cinema – a gigantic puzzle. Museum audiences, usually presented with paths and pre-digested accounts, had to rely on nothing but their intuition to guide them. Lalor’s text grew out of his encounter with and response to Godard’s exhibition. It flows along, unpunctuated, personal and authentic – walking in his mind, sketching things out, a flâneur amidst his own thoughts and ideas. The latest version of the artwork ‘Stereo JLG’ – currently published in the Irish Times – constitutes an exploration of ‘Journalism’ –one of the 4 modalities the artwork investigates, as outlined in Lalor’s statement above. The next episode of Stereo JLG / the editing of the trailer will appear in the 24th April issue of the Irish Times. 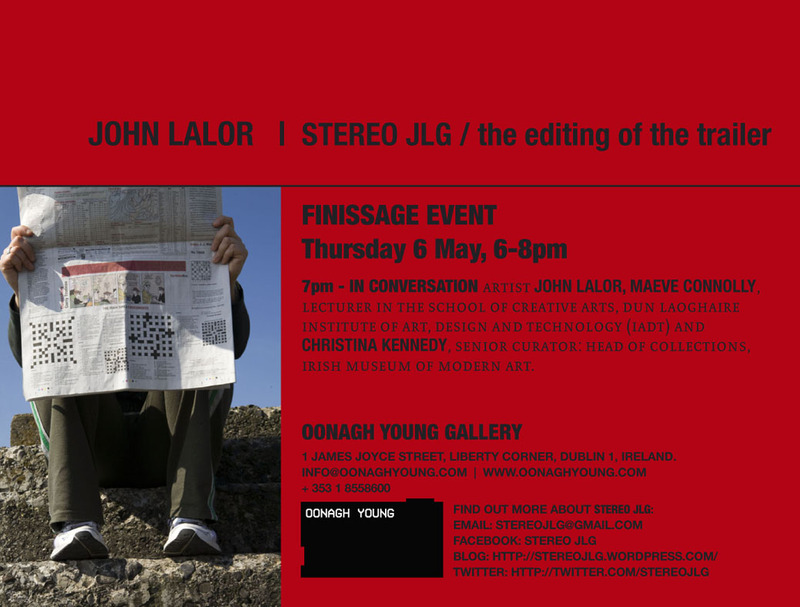 Stereo JLG / the editing of the trailer is a text- based artwork by Irish artist John Lalor, which is currently emerging within the pages of the Irish Times. 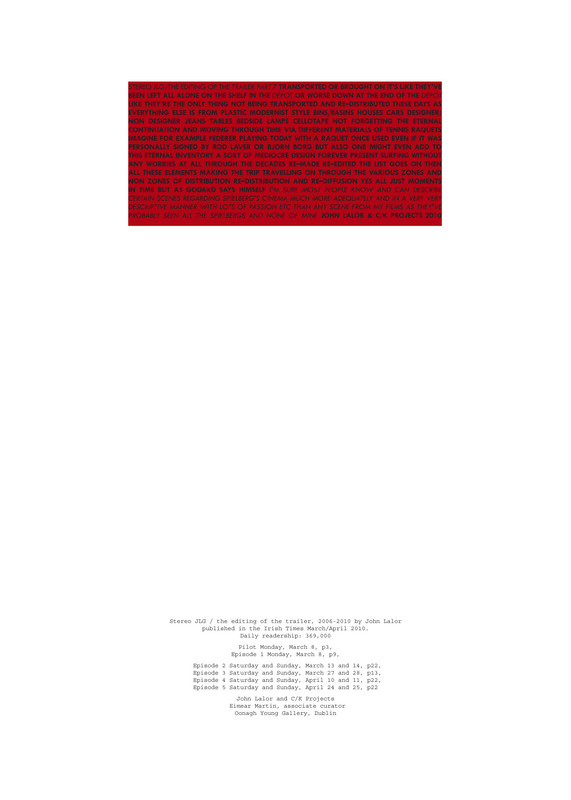 Characterised by black text on a red ground, the work is arranged in 7 episodes. The pilot and the first episode appeared among the World News pages on 8th March, on the Bulletin page on 13th, another on the 27th March, with forthcoming episodes scheduled for the 10th and 24th April issues. The concluding episode will co–incide with an event at the Oonagh Young Gallery, Dublin on 6th May. This is the latest iteration of a piece which the artist created 4 years ago, in response to a major exhibition at the Pompidou Centre, Paris, “Voyage(s) en Utopie, Jean-Luc Godard, 1946-2006. A la recherche d’un théorème perdu”, celebrating legendary Franco-Swiss filmmaker Jean- Luc Godard, where Godard in true fashion subverted the museum’s curatorial machine to render an event which itself defied any pre-digestion for its audience. Lalor’s text grew out of that encounter, and flows along, unpunctuated, personal and authentic, a spinning wheel of images and ideas. Working within the organisational system of the Irish Times, its language, format, house style – the siting of each episode depends on the sub-editor’s layout decisions. Modest in scale, it fits in and presents as a piece that can change itself and items around it. It is quietly radical. It re-shapes the landscape of the newspaper as it passes through. active member and director of Glassbox, a pioneering artists-run space from 2004-07 in Paris. John Lalor is currently working on the publication of a collection of his writings in English and French, entitled ‘Found in translation’, as well as as film project entitled ‘Un incident urbain’ (An urban incident) around French architect Dominique Perrault’s BNF building (the French National Library) and Marin Karmitz’ nearby MK2 independent cinema, featuring actor Jean-François Stévenin and André S. Labarthe (actor, critic, film producer and director). Next episode will appear tomorrow in The Irish Times.